← “Getting into Shapes” Opening Reception THIS weekend!! Check out this upcoming Call to Artists for the Community Food Bank of Southern Arizona! 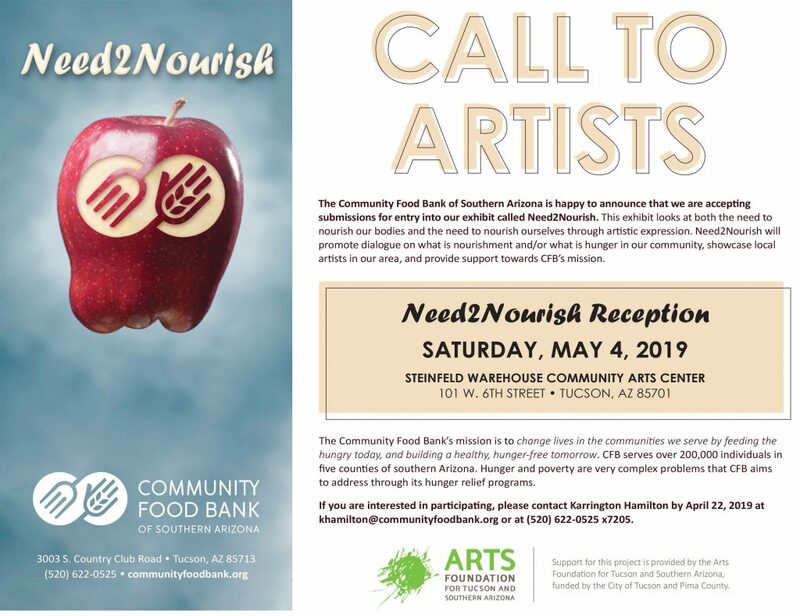 The Community Food Bank of Southern Arizona is happy to announce that they are accepting submissions for entry into the upcoming exhibit called Need2Nourish. This exhibit looks at both the need to nourish our bodies and the need to nourish ourselves through artistic expression. Need2Nourish will promote dialogue on what is nourishment and/or what is hunger in our community, showcase local artists in our area, and provide support towards CFB’s mission. The Community Food Bank’s mission is to change lives in the communities we serve by feeding the hungry today, and building a healthy, hunger-free tomorrow. CFB serves over 200,000 individuals in five counties of southern Arizona. Hunger and poverty are very complex problems that CFB aims to address through its hunger relief programs. If you are interested in participting, please contact Karrington Hamilton by April 22, 2019 at khamilton@communityfoodbank.org or at (520) 620-0525 x7205.